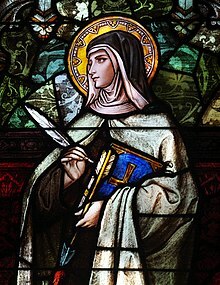 St. Teresa of Ávila. In traditional Christian iconography, saints are often depicted with halos as a symbol of holiness. A saint is a person who is recognized as having an exceptional degree of holiness or likeness or closeness to God. However, the use of the term "saint" depends on the context and denomination. In Roman Catholic, Eastern Orthodox, Anglican, Oriental Orthodox, and Lutheran doctrine, all of their faithful deceased in Heaven are considered to be saints, but some are considered worthy of greater honor or emulation; official ecclesiastical recognition, and consequently veneration, is given to some saints through the process of canonization in the Catholic Church or glorification in the Eastern Orthodox Church. While the English word saint originated in Christianity, historians of religion now use the appellation "in a more general way to refer to the state of special holiness that many religions attribute to certain people", with the Jewish tzadik, the Islamic walī, the Hindu rishi or Sikh guru, and the Buddhist arhat or bodhisattva also being referred to as saints. Depending on the religion, saints are recognized either by official ecclesiastical declaration, as in the Catholic faith, or by popular acclamation (see Folk saint). "Scripture does not teach calling on the saints or pleading for help from them. For it sets before us Christ alone as mediator, atoning sacrifice, high priest, and intercessor."—A.C. Article XXI. ...that shortly after Jonah of Manchuria died in 1925, he is said to have appeared in a dream before a crippled boy saying "Here, take my legs. I don't need them anymore," and the boy woke up completely healed? ...that the Lutheran liturgical calendar includes several biblical personages as “Saint” though it is commonly believed that Lutherans “do not have saints”? ...that the Martyrologium Hieronymianum, though not written by Saint Jerome himself, was the most widely-used martyrology during the Middle Ages? Saint Gregory of Nazianzus (330 – January 25, 389 or 390) (also known as Gregory the Theologian or Gregory Nazianzen) was a 4th-century Archbishop of Constantinople. He is widely considered the most accomplished rhetorical stylist of the patristic age. As a classically trained speaker and philosopher he infused Hellenism into the early church, establishing the paradigm of Byzantine theologians and church officials. Gregory made a significant impact on the shape of Trinitarian theology among both Greek- and Latin-speaking theologians, and he is remembered as the "Trinitarian Theologian". Much of his theological work continues to influence modern theologians, especially in regard to the relationship among the three Persons of the Trinity. Along with two brothers, Basil the Great and Gregory of Nyssa, he is known as one of the Cappadocian Fathers. Gregory is a saint in both Eastern and Western Christianity. In the Roman Catholic Church he is among the Doctors of the Church; in Eastern Orthodoxy he is revered as one of the Three Holy Hierarchs, along with Basil the Great and John Chrysostom. The Saints Wikiproject aims primarily at standardizing the articles about people venerated by some Christians as saints or the blessed and ensuring quality articles. If there is an interest in including saints from religions other than Christianity, please propose those changes on our talk page.